U.S. stocks erased intra-day gains on Friday, capping a second straight weekly loss for the S&P 500. Wall Street was beset by a return of volatility, stemming largely from political drama out of Washington D.C. and a series of terrorist attacks in Spain and Finland. All three major domestic equity averages finished the week at their lowest levels since July as investors responded to news the Federal Reserve retained a hawkish rate outlook despite soft inflation, European concerns about a too-strong euro, and denied rumors of a rift between President Trump and his trusted top economic adviser, Gary Cohn, who was reportedly upset over a botched presidential response to the violent conflicting protests in Charlottesville, Virginia. Stocks swung from opening losses to gains and back again after a report Friday that Steve Bannon was ousted from his White House chief strategist job. Overall, investors are growing dismayed that recent controversies, both foreign and domestic, are making it much more difficult for a divided Congress to work with President Trump to pass his pro-growth policy goals. For the week, the S&P 500 fell -0.58%, the Dow Industrials declined -0.77% and the MSCI EAFE (developed international) rose +0.07%. Following last week’s spike in equity market volatility due to rising geopolitical tension, markets have begun to sink back into their summer lull as investors refocus on fundamentals. Strong earnings, low interest rates and solid economic data have led to easier financial conditions, which, along with low realized and macroeconomic volatility, has pushed implied volatility, as measured by the VIX, to very low levels. As shown in this week’s chart, financial conditions have been more accommodative than average since the start of 2017, with low interest rates holding both company and household interest costs low, and meaningful earnings growth putting more money in the pockets of both investors and corporations. 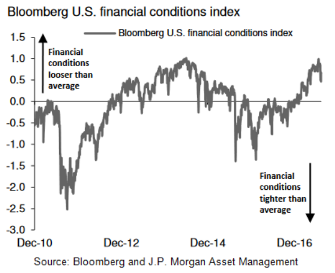 Supportive financial conditions have also coincided with solid economic performance – as evidenced by strength in retail sales, business optimism and further tightening in the labor market – supporting J.P. Morgan Asset Management’s view that U.S. economic growth should continue at a slow-but-steady pace. While investors may remain concerned with the low volatility environment, history tells them that markets have historically been able to push higher following periods of low volatility, particularly when the fundamentals look solid. As such, continued economic momentum and strong earnings growth should provide support for the U.S. equity market despite a backdrop of elevated valuations and political uncertainty.